Nov 12, 2018 BIDDING ENDS 6 PM! Includes 75 +/- acres of income producing quality farmland located in Boone Township of Harrison County. Property has road frontage on Rehoboth Rd & Old Goshen Rd. Located in an area that farms rarely come available! Located in Boone Township of Harrison Co, frontage on Rehobeth Rd & Old Goshen Rd! CLICK ON “VIEW DOCUMENTS” ABOVE FOR AERIALS, SOIL DATA, TAX INFO, ETC. 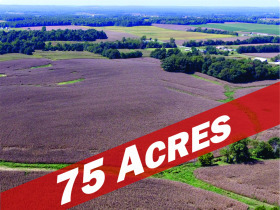 REAL ESTATE INFO: A rare opportunity to purchase 75 +/- acres of quality farmland in Boone Township of Southern Harrison County that has been family owned for nearly 150 years. Per FSA, farm includes 73 +/- tillable acres. Features: 480’+/- of road frontage on E Old Goshen Road, 1200’ +/- road frontage on Rehoboth Road, and no improvements. Sells in one tract, property will not be offered separately. INSPECTION: Vacant land-view anytime or call office for private showing. POSSESSION INFO: Possession at closing on all real estate, sells subject to fall harvest rights on tillable acreage. MINERAL RIGHTS: Includes sellers’ interest in mineral rights. SOIL DATA SHEETS: Visit “view documents” section for soil data maps. TAXES: $749+/- per installment based on current owner exemptions. DIRECTIONS: From Laconia, north on IN-11 2.3 miles, right on Old Goshen Road 1.0 mile, right on Merk Rd 0.5 mile, and left onto Rehoboth Road to site. From Corydon, south on IN-337 10 miles, right on IN-11 1.0 mile, left on E Old Goshen Rd 1 mile, right on Merk Road 0.5 mile then left on Rehoboth Rd to site.